Now, almost two decades later, I finally did. Chrono Cross is still an amazing game whose early 3D graphics have aged better than most, but it’s not without some major design flaws that somewhat tarnished my teenage memories. I actually owned Chrono Cross before I ever owned a PlayStation. In the late 90s/early 2000s, emulators were all the rage. We were going nuts over being able to download ROMs of SNES games and play them on our PCs. 8-bit and 16-bit games were easy, but modern CDs proved tricky. A PlayStation emulator existed, but you needed to own the actual game discs for it to work. I was becoming more and more of a PC gamer at the time, but still loved a few Japanese RPGs, such as Suikoden 2 and Chrono Cross. I purchased and originally played both of those games on an emulator on my PC. Unfortunately I reached a point about 3/4 through where my game consistently crashed during a boss fight in Chrono Cross. I couldn’t finish the game. Eventually I moved on. Leaving it unfinished has been hanging over my head for years. I was a big fan of Chrono Trigger and the sequel had a large, diverse cast of characters, interesting battle system, and an amazing soundtrack. At one point I tried to start it up on an actual PlayStation (which I eventually bought a few years later for super cheap) but never got more than a few hours in. This year I saw it on sale on the PlayStation Store, and was determined. My wife had won or earned (I forget) a Sony PSP-3000 a few years ago, and it had sat mostly unused in a closet. I dusted it off, ordered a new battery, downloaded Chrono Cross, and finally played through it all over again. As a direct sequel to Chrono Trigger, Chrono Cross alters the time-theme quite a bit. It does away with time-traveling in favor of jumping between two distinct dimensions, and saves much of its sequel connections until the last few hours. The opening is very cool, however, as our protagonist, Serge, falls into a time-hole and ends up in a bizarre alternate version of his world in which he had died as a child. The story teases out the lovely, bright world of the El Nido archipelago while sprinkling in its many, many characters. I’ll be honest: there’s too many damn characters. Chrono Trigger had all of seven party members; the sequel added over 40. Having a huge cast is awesome in a series like Suikoden, which is all about gathering allies and building an army (not to mention having six people in your active party). With Chrono Cross, however, you only ever have three people in your party, and one of them is your main character. It would take an annoying amount of grinding to get everyone up to speed, fully equipped, and have their Element grid filled out. It’s also frankly unnecessary as the game almost never forces any particular characters upon you. Other than a very major event at about the 1/3 point, you can feasibly take the same few people with you everywhere. That major event is still chilling and fantastic. After you battle your way through the alternate world, making friends and uncovering mysteries, you reach a climax where the main villain, Lynx, murders your best bud as he and Serge literally switch bodies, and you’re catapulted into a weird time vortex, stripped of all the allies you’ve made along the way. It still ranks up there as one of the best twists and moments in RPGs (and the cutscenes still look pretty good). On the flip side, I was much more critical with going back through the same content again. The entire world of El Nido isn’t very large compared to most RPGs, and it feels artificially lengthened since you essentially go through each area twice via the two different dimensions. It makes the back half of the game far less interesting, even though you’re meeting new people and engaging in different events. Not until the very late stages of the game do you open up the final two dungeons that actually offer new areas to explore. I also disliked that most of the big story stuff is saved until the very end. The first 40 or so hours can be played on Disc 1, with Disc 2 holding the last 5-10 hours, most likely due to the large number of cutscenes. The story devolves into some tenuous and borderline awful connections to Chrono Trigger that treat the previous characters very poorly. There’s too much exposition and plot reveal dumped on you. By the end I cared little about the main quest, as you defeat Lynx/Dark Serge/Fate even before you step foot into the final dungeon. While the story was ultimately disappointing, where Chrono Cross really shines is its incredible character design. Yes there are too many characters and only playing with three at a time is a big bummer, but nearly each character is well-written, well-designed, and has at least one nice little personal quest you can engage in. Much of the latter parts of the game involve going around with different party members and completing their personal stories. I appreciated these moments even if I ended up ignoring most of the cast to focus on the ones I really enjoyed. The Dario saga between Karsh and Riddel is particularly engaging. The combat is also a lot of fun. Any JRPG that lets you see enemies before you enter the turn-based battle gets a big thumbs up from me. Each character can equip a variety of spells called Elements along a grid. I’m not going to try and explain the entire system but it allows you to use abilities in every single fight rather than having to worry about conserving mana or spell slots. Post-battle healing is also done through these Elements, which has the interesting side effect of making battles kind of pointless. Characters don’t level up at all, instead they get little incremental stat boots, with the biggest ones coming in the next few battles following a boss fight. It’s very odd and motivated me to skip battles whenever I could in the latter half of the game as the challenge level completely dropped off. The other weird effect is that the main character becomes disproportionally stronger than everyone else. It makes sense – keep changing around the other two slots and Serge will naturally be stronger since he’s always there getting the stat boosts. Once I obtained the mastermune, my best strategy in every fight was to use everyone else for healing and buffs while Serge did all the work, doing like four times as much damage as my next best character regardless of elemental affinity. Considering there’s so many cool characters to choose from, from cigar-smoking pirates to cutesy aliens and faeries to mermaids and even two different sentient flowers and a sentient mushroom, it’s extremely disappointing that they all boiled down to simply keeping Serge alive so he could do all the heavy lifting. Yet despite all my nagging criticisms, I still love this game. 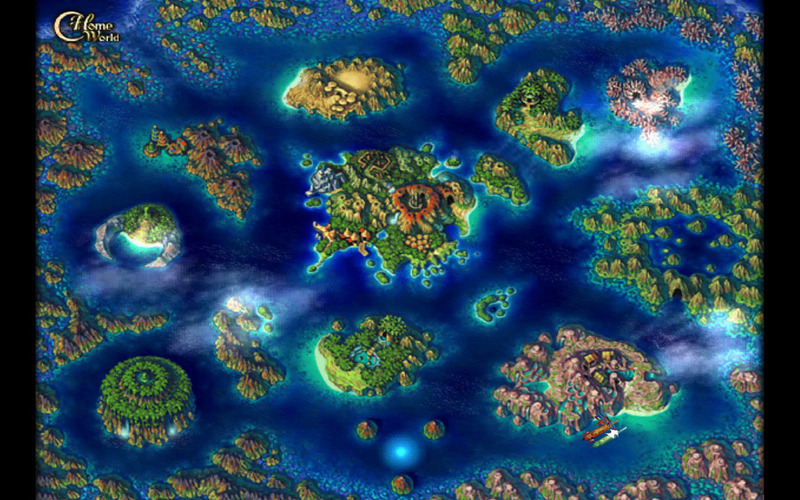 The island setting is fun to explore, there’s a ton of secrets and characters and things to find, and it still has my favorite soundtrack in gaming (calm down, Chrono Trigger is like my no. 2 or 3). I also appreciate that despite my overall enjoyment falling off at the end, the game doesn’t wear out its welcome. I was able to beat it at 45 hours, though admittedly I skipped quite a bit of optional content. 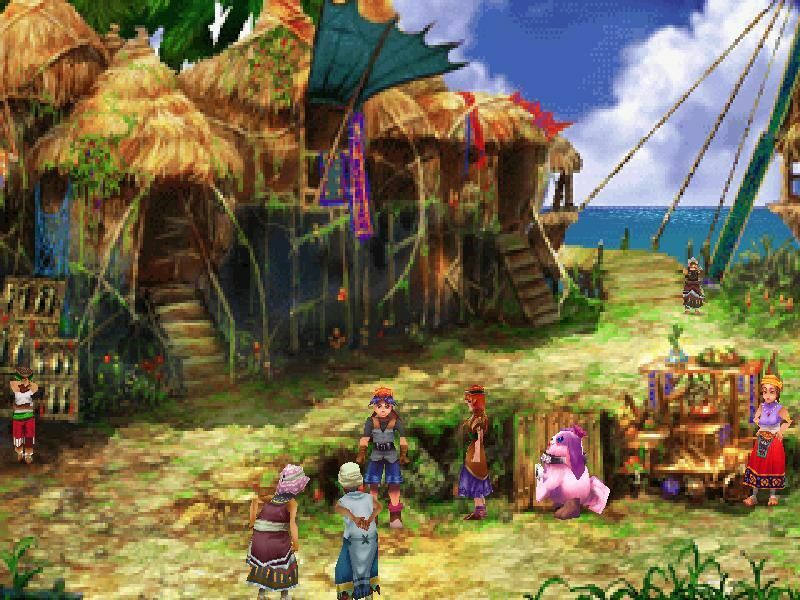 Chrono Cross still deserves all its praise as one of the best RPGs around, but ultimately Chrono Trigger stands the test of time a bit better. The best soundtrack in gaming. Huge, diverse roster of party members, most of whom are well-written and interesting. Element grids offer a unique approach to spells that gives total customization for each character, and lets you unleash abilities in every fight. The islands are fun locations to explore, especially when you gain the freedom to explore them on your own. The opening hours do a wonderful job setting the stage, teasing the mysteries, and teaching the game. There are way too many damn characters, and the Element system makes it a pain to equip them all, and makes them a bit too homogeneous since anyone can use any Element (with a few exceptions). 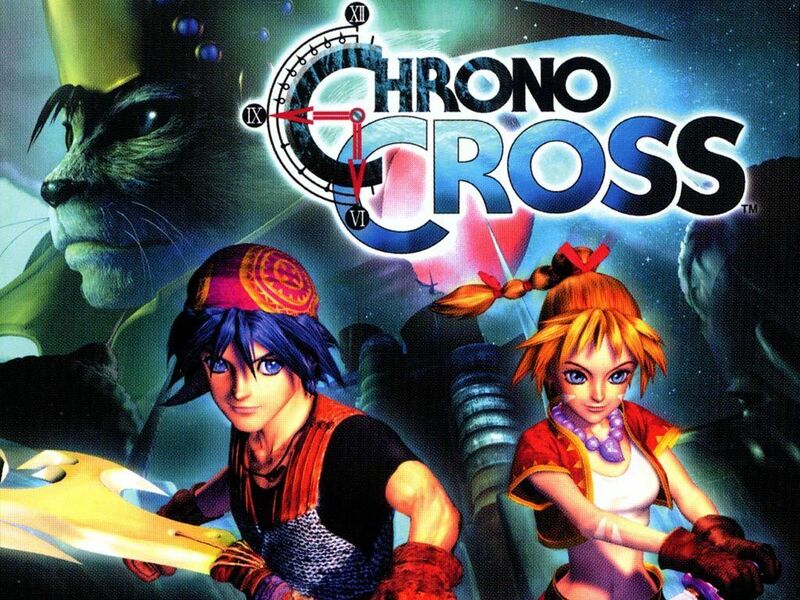 Chrono Cross is not a difficult RPG but the challenge level drops off sharply in the later stages of the game. Only boss fights matter and even then, most aren’t very challenging. The story becomes convoluted and obtuse by the end, neutering its primary villain and saving too much exposition for the penultimate dungeon crawl. 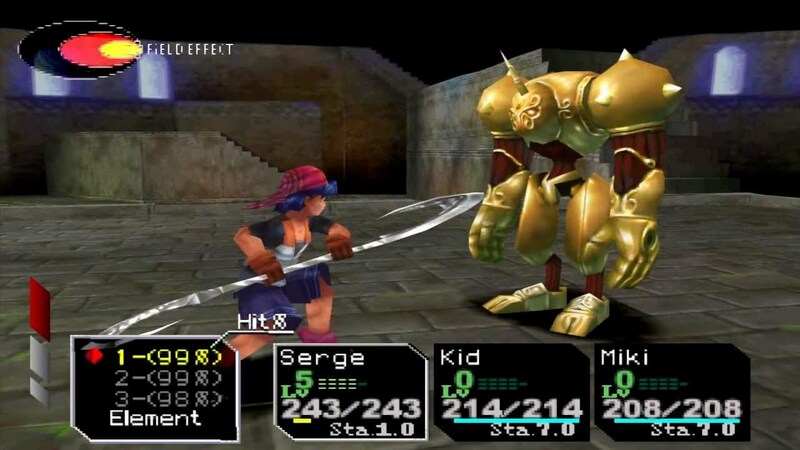 Final Thoughts: Though it doesn’t quite maintain its high quality all the way through, Chrono Cross remains one of the greatest console RPGs of all time.